Burgers, chicken sandwiches, fried chicken tenders, and fish fillets. Each of these dishes has one thing in common: they’re what people think of when they think of fast food menu items. This might not seem like a big deal … until you decide to go plant-based and find yourself on a road trip or traveling extensively for work. How on earth do you go about finding plant-based fast food? Luckily, doing this has never been easier, and we’re here to walk you through it. Finding plant-based fast food is easier than you think. With the rise of plant-based diets like veganism and vegetarianism in the past few years, many fast food chains have started to move away from burger-and-chicken based menus, to ones featuring more veggies, nuts, fruits, and even soy-based “meat” products. 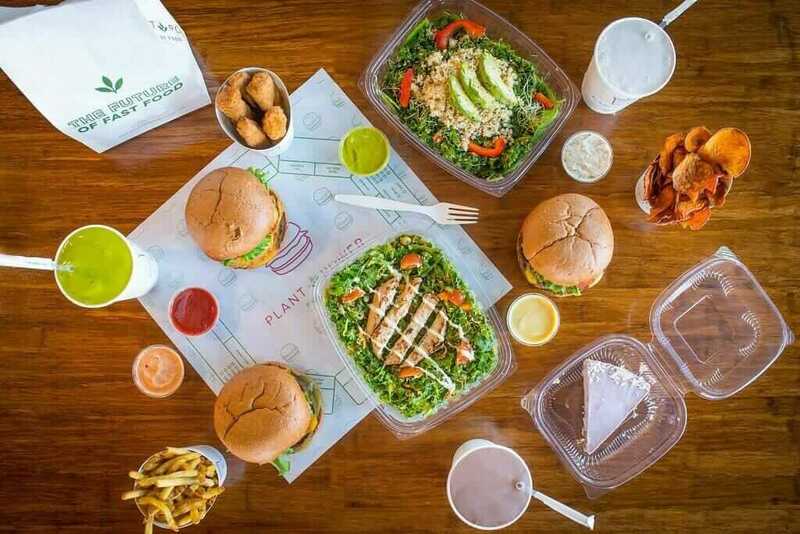 Plant Power Fast Food is an entirely plant-based fast food chain located in San Diego and Encinitas, CA. Staying true to the real food movement, their slogan, “The Future of Fast Food,” say it all. Not to mention, Plant Power Fast Food doesn’t skimp on quality, even though they are labeled as a “fast food” chain. All ingredients are free of artificial flavors and ingredients, high-fructose corn syrup, hydrogenated oils, and trans fats. All meatless “burger” and black bean patties are made fresh daily in-house, not from frozen. Their regular fries and sweet potato medallions are also cut fresh and prepared each day. To top all this off, they off you an organic soda. Wrap your hands around the Canadian Bacon, Provolone & Egg’ Muffin, made with Tofu ‘egg’, Canadian ‘bacon’, ‘provolone cheese’, spinach and ‘mayo’ on a toasted English muffin OR, if you’re looking for sweetness, try the gluten-free Waffle Jammer, featuring creamy maple ‘aioli’ sandwiched between two crispy waffles. Dig into the BBQ “Chicken” Salad made with organic chopped romaine, cilantro, corn, black beans, cherry tomatoes, BBQ Ranch, guacamole and filled with grilled or crispy ‘chicken’. Add a kombucha or a Green Dream smoothie with spinach and orange with almond milk on the side. Indulge in your very own vegan taco night when you try the gluten free Raw Tacos featuring seasoned walnut and pecan taco meat, cashew hummus, guacamole and shredded veggies in cabbage shells. If you’re feeling a traditional burger taste, go for gluten-free and organic Mushroom Swiss Burger with sautéed mushrooms, swiss ‘cheese’, lettuce, tomato and ‘mayo’. Wrap up dinner with the healthiest plant-based dessert imaginable: a kombucha float. These floats feature flavored Trilogy Kombucha with various non-dairy ice cream flavors, like chocolate and strawberry. There’s no lack of plants at these other vegan- and vegetarian-friendly chains. Check them out below. Chipotle is an easy place to create your own vegan dish. Simply substitute the meat in any bowl or burrito with Sofritas – a meat substitute made with organic soybeans and simmered in an herb-y sauce. Behold: Mellow Mushroom has a vegan menu. Not only does it let you build your own vegan pizza with Daiya dairy-free cheese, tofu, or tempeh, but also features calzones, hummus, salads, and even hoagies. Cheesecake Factory’s menu is extensive, so you can usually construct a salad or dish out of veggies and keep your meal vegan if you make sure to avoid the cheese and meat. However, they also offer a Vegan Cobb Salad that contains lettuce, grilled asparagus, green beans, beets, avocado, tomato, cucumber, sunflower seeds, chickpeas, almonds, and quinoa. When most people think of Denny’s, they envision eggs, bacon, sausage, and even burgers. Interestingly enough, however, Denny’s serves Amy’s veggies burgers so that you can construct your own vegan burger when you choose a Build Your Own Burger on their menu. As you can see, many of these fast food chains are similar in what they offer as far as plant-based dishes go. In almost every chain, you can construct a salad (or even just stick to fries and apple slices at places like Burger King and Chick-Fil-A) and avoid meat products.